An entrance to Philadelphia Mills mall, formerly Franklin Mills, in Northeast Philadelphia. A loan backed by the former Franklin Mills mall in Northeast Philadelphia has been assigned to a company that manages troubled commercial mortgages — a “special servicer” — for the second time in less than a decade, indicating that owner Simon Property Group may again be in danger of default. The $278.2 million mortgage backed by what’s now known as Philadelphia Mills was sent back into special servicing in March, a few months before Indianapolis-based Simon would have been required to refinance or repay the loan, according to a report this week by commercial real estate debt-tracker Trepp LLC. Subaru’s former North American headquarters in Cherry Hill will be demolished. Who will buy the property? Special servicers are appointed when there is a loan default or a concern that a property’s value has deteriorated. They are generally responsible for preserving the property’s value so that bondholders can be repaid as much of the loan amount as possible through an eventual sale. Mall landlords are increasingly giving up on financially troubled retail centers amid the loss of disappearing or downsizing tenants such as Macy’s Inc. and Sears Holdings Corp., Bloomberg News reported late last year. The practice leaves banks in possession of properties that are often worth less than the balance of their mortgages, opening investors in that debt up to potentially big losses. Philadelphia-based mall landlord Pennsylvania Real Estate Investment Trust said last month during a conference call with analysts that it was in talks with the special servicer overseeing its loan for the Wyoming Valley Mall near Wilkes-Barre to shed that property from its portfolio. PREIT’s other assets include the Cherry Hill Mall and a partnership stake in Center City’s Fashion District Philadelphia project, as the redeveloped Gallery at Market East is to be known. Philadelphia Mills owner Simon’s other properties include the King of Prussia Mall in Montgomery County, which is the nation’s biggest mall and one of its most financially successful. Philadelphia Mills, on Woodhaven Road near the Northeast Philadelphia border with Bucks County, is the city’s largest mall. Servicer C-III Asset Management LLC took over the Philadelphia Mills loan because of its fast approaching “maturity date” of June 2019, at which time Simon would be responsible for repaying the debt or rolling it into a new mortgage, according to Trepp. The report did not indicate why Simon’s master servicer on the mortgage, Wells Fargo & Co., feared that the approaching maturity date may put the loan in danger of default. But it noted that the 1.58 million-square-foot mall’s vacancy rate had risen in recent years, with the loss of tenants including Bed Bath & Beyond, a Kenneth Cole outlet, and an Aldo Group shoe store. It is often difficult for landlords in such circumstances to access new loans to refinance earlier mortgages, since lenders may question their ability to service that debt with revenue from their properties. A mall with sinking occupancy numbers may also be valued at less than the amount its owner needs to borrow when it’s appraised for a new mortgage. Wells Fargo spokesperson Beth Richek declined to comment on the loan. A Simon spokesperson had no immediate comment. 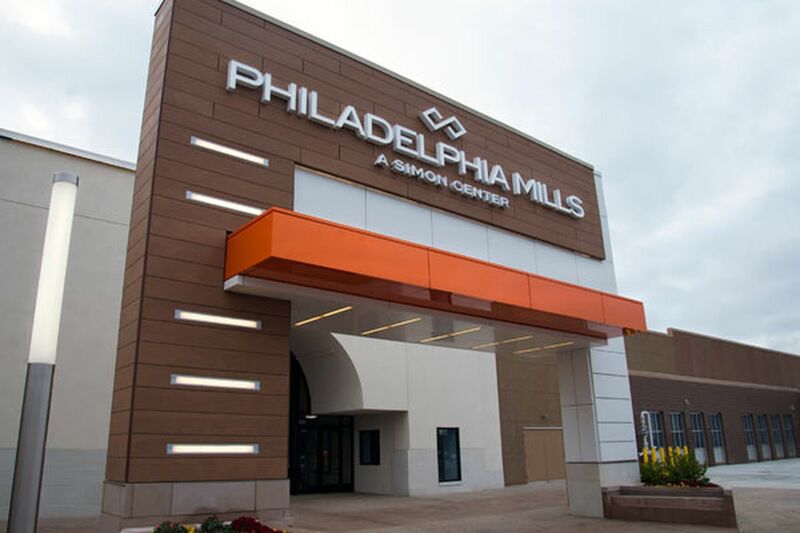 The mall’s apparent troubles come about three years after Simon concluded $30 million in renovations at the retail center that accompanied its name change from Franklin Mills to Philadelphia Mills. Simon’s loan for the property last entered special servicing in 2012 after it reduced some tenant rents amid a wave of lease expirations, Trepp said. The mortgage emerged from special servicing the following year after Simon negotiated a modification that slashed the loan’s interest rates, forgave $11.8 million in principal, and set the June 2019 maturity date, according to Trepp’s report. The Philadelphia Mills woes followed trouble at the adjacent shopping center now known as Liberty Plaza, which fell to a special servicer in 2013, about a year before its then-anchor business, a Walmart store, vacated the property. Shortly after the servicer took over that loan, the shopping center’s owner, a Simon affiliate, transferred the property to its lender at the site, U.S. Bank NA, in lieu of foreclosure. A unit of Huntingdon Valley-based Sant Properties LP paid $10.4 million for the center last year.